In July 1955, Dr. Robert C. Wesley, a captain in the USAF stationed at Sampson Air Force Base in Geneva, New York, wrote to the Lynchburg Academy of Medicine, requesting an application for membership. Dr. Wesley completed the application and forwarded it to Dr. Joseph Houck, a well-established Lynchburg surgeon. Wesley asked Houck to endorse the application and secure a second required recommendation. 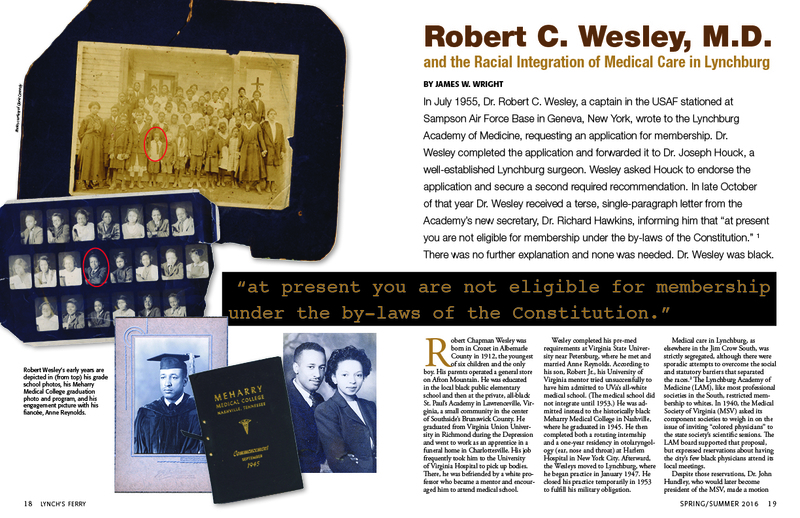 In late October of that year Dr. Wesley received a terse, single-paragraph letter from the Academy’s new secretary, Dr. Richard Hawkins, informing him that “at present you are not eligible for membership under the by-laws of the Constitution.” There was no further explanation and none was needed. Dr. Wesley was black. Robert Chapman Wesley was born in Crozet in Albemarle County in 1912, the youngest of six children and the only boy. His parents operated a general store on Afton Mountain. He was educated in the local black public elementary school and then at the private, all-black St. Paul’s Academy in Lawrenceville, Virginia, a small community in the center of Southside’s Brunswick County. He graduated from Virginia Union University in Richmond during the Depression and went to work as an apprentice in a funeral home in Charlottesville. His job frequently took him to the University of Virginia Hospital to pick up bodies. There, he was befriended by a white professor who became a mentor and encouraged him to attend medical school. Wesley completed his pre-med requirements at Virginia State University near Petersburg, where he met and married Anne Reynolds. According to his son, Robert Jr., his University of Virginia mentor tried unsuccessfully to have him admitted to UVa’s all-white medical school. (The medical school did not integrate until 1953.) He was admitted instead to the historically black Meharry Medical College in Nashville, where he graduated in 1945. He then completed both a rotating internship and a one-year residency in otolaryngology (ear, nose and throat) at Harlem Hospital in New York City. Afterward, the Wesleys moved to Lynchburg, where he began practice in January 1947. He closed his practice temporarily in 1953 to fulfill his military obligation.